In some ways, it feels like yesterday. In others, it seems like forever ago. My water broke at 2:30 am, February 13th. I was at the hospital by 3am. Just 4 hours later, by 7 am, they were inserting the epidural. For the next 16 1/2 hours, I was in my room, listening to my "Music to Give Birth By" mix (which all the staff were loving, regularly coming into my room to see what song was playing next) and talking with my husband between contractions. As time went on, however, I seemed to have stopped dilating at around 9 centimeters. 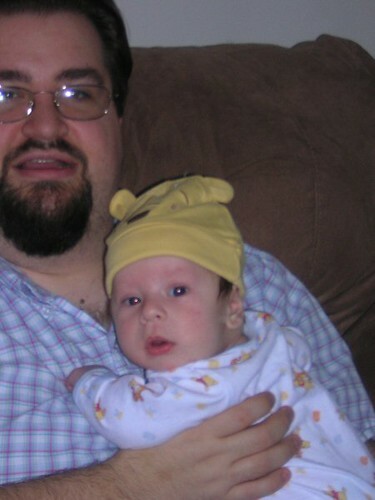 Around 11 pm that night, my doctor suggested a C-Section. And I agreed. I was dippy on the medication that they gave me. I felt no pain, in so many ways. And while many parts of the surgery weren't clear, I do vaguely remember the doctor holding this beautiful little boy up for me to see. Rich said that he commented, "He's not a baby, he's a 2 year old!" Weighing in at 8 pounds, 13 ounces and 21 inches long, Theadore entered the world. Being born at 11:35 pm, he was 25 minutes shy of being a Valentine's baby. And for all that he filled my heart with more love than I could have ever imagined, I was glad that he was born on the 13th. I still remember holding him in my arms,. I remember the fumbling as we tried to figure out nursing, the uncertainty as I learned to change him, the love I felt whenever I held him. I remember having to bring new clothes for him to wear because the going home outfit we'd brought was too small. Instead, he came home in a dinosaur sleeper that was a little too big. Those first few months were rough. He was getting used to life outside the womb. I was getting used to life with someone depending on me entirely. But somehow, we managed to make it. Over the last six years, I've watched him grow from a beautiful, pretty happy baby who could barely hold his head up to a funny, sensitive, intelligent little boy who, for all that he hates being thwarted, still does try to help out his Mommy, Daddy and Little Brother. He still can amaze me with the things he knows and the things her learns. He brings back my own childhood as I watch him go through his - both the good and the bad. While he's no longer the only child in the household, he never seems to resent his brother - and hasn't from the first. He wants to show Pete how to do things and beams with pride when Pete shows off his knowledge, often calling out, "Mommy, look what I showed Pete how to do!" My boy has a weird sense of humor (but who could blame him with the parents he has), a sensitive heart (taking every negative far too personally - again, who could blame him as he's my son) and a first rate mind. He isn't the boy that I dreamed having as my son - he's far, far more than I could have ever imagined. And I love him far more than I could have ever imagined too. Happy birthday, Teddy. I love you so very much and am so proud of what you've accomplished in the last 6 years. And I know that it's just the beginning of the wonderful boy - then man - that you will become. My bright-eyed little boy at 3 months old, being held by Daddy. In my heart, no matter how much he looks like the bottom picture, he'll still always be the top one to me.